Many of Families Worldwide’s loyal customers book their next holiday as soon as they return from the previous one to ensure they get exactly what they want. What’s more Families Worldwide is offering up to 15% off all new bookings made between now and the end of August! October half term holidays are already getting snapped up, despite the fact that it is early August, and here are some of the most popular itineraries that still have plenty of availability. Discover the diversity of Morocco on the 7-night Atlas Mule Train trip departing 18 and 25 October. 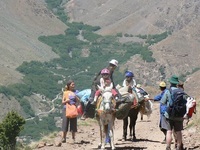 Highlights will include magical Marrakech – whose famous main square bursts into life every evening when the jugglers, acrobats, snake charmers, musicians and food vendors arrive – meeting a friendly Berber tribe and mule rides in the Atlas Mountains. The trip can also be extended with a few days in the Portuguese fishing port of Essaouira on the Atlantic coast. The holiday costs from £699 per child (age 2+) and £759 per adult which includes flights, all transportation, 7 nights’ accommodation, some meals and the services of a tour leader. Based in Sorrento, highlights of the 8-day Vesuvius & Pompeii trip to Italy will include uncovering the secrets of Pompeii, a trek up Mount Vesuvius, a visit to the volcanic museum, a boat ride to Capri with a cruise around the island and a drive along the Amalfi Coast before heading for the hills for a pre-lunch walk. There is also an optional trip to Naples or a visit to the preserved Roman ruins of Herculaneum. In Sorrento there will even be a chance to cook pasta with the hotel's chef. The holiday departs on 18 and 25 October and costs £1179 per child (5+) and £1199 per adult which includes flights, all transportation, 7 nights’ B&B (plus two lunches and one dinner), activities and a tour leader. Highlights of the exciting 9-day Taj and Tigers trip to India include an exploration of the pink city of Jaipur, a city tour of Old Delhi, a tiger safari in the famous Ranthambhore National Park, visit to the Taj Mahal at sunrise, an elephant ride following a visit to the Amber Fort, a rickshaw ride and seeing a Bollywood film and puppet show. The holiday departs on 17 and 24 October and costs from costs from £1299 per child (min. age 5) and £1499 per adult which includes flights, all transportation, 9 nights’ accommodation, some meals, activities as detailed on the itinerary and the services of a tour leader. Known as Buddha’s Island, Sri Lanka – previously called Ceylon – is a country of enormous variety. Highlights of the 9-day Ceylon Discovery include the caves and temple at Dambulla, a cycle ride through local villages (plus a cookery lesson), climbing the rock at Sigiriya and a visit to a tea plantation. The trip departs on 23 October and costs from £1499 per child (age 5+), £1699 per adult, which includes flights, all transportation, 12 nights’ B&B (plus 1 lunch and 3 dinners) and a tour leader. Land only prices are available on all holidays for those who prefer to book their own flights. For more information, visit familiesworldwide.co.uk.